You know those guys that make videos and fake movie trailers out of bits and pieces of other movies? I wish someone would do that with the films Ray Harryhausen has worked on. Here is a guy so good at visual effects that most of the directors he worked for counted on him alone to carry the team to victory. If you took the best parts of the movies he worked on and spliced them together in some sort of coherent way, you would get a really cool video. If we're going to sit our butts down for a film-length runtime, though (even one as short as those of the 1950s), there has to be more to it than special effects, no matter how good the monster looks. 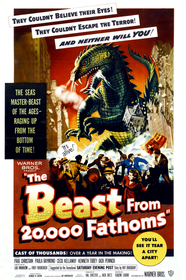 The Beast from 20,000 Fathoms yet again proves that there are limits even to what a visual effects master like Harryhausen can do for a movie. The premise of the movie is promising, setting itself up to be a commentary on the horrors of radiation and nuclear weaponry. An enormous dinosaur, frozen alive, has been set loose by American nuclear bomb tests near the North Pole. Professor Tom Nesbitt, the only surviving witness of the creature's existence, can't convince anyone it exists ... until it begins attacking North America. Our weapons can't stop him, so we're forced to come up with a solution beyond simply firing bullets and artillery. Otherwise, he'll eat us all!! Despite the setup, the writers have no idea what to do with the material. They decide that the best way to spend the first forty minutes of the movie (which only has forty more to give afterward) is to watch Nesbit try over and over again to convince people that he saw what he says he saw. From there the movie's more pertinent concern, the nuclear weaponry theme, degrades into nothing more than a "diagnose problem, apply solution" formula. When they figure out that conventional weaponry won't work against the beast in question, they simply figure out what will work and implement the technique (and here I was thinking the scientific method was a time-consuming process). The solution is neither creative nor thought-provoking: shoot the monster with a radioactive isotope gun. Furthermore, the outcome is not the least bit surprising. The final scene is enjoyable only for the facts that it takes place on a roller coaster track and that the person firing the gun is none other than Lee Van Cleef, the actor who would go on to be a renowned Spaghetti Western villain. And when all is said and done, there is no post-climax falling action, probably because the writers don't know what to do now that their monster is dead. You may be thinking, "But doesn't this film function as a metaphor for the horrors of nuclear weapons rather than a simple giant monster movie?" Yes and no. It can be viewed as a metaphor for the horrors of nuclear weapons; however, it never surpasses the level of "simple giant monster movie" because it does absolutely nothing with the nuclear weapon theme. It lays the theme out up front, and then walks right past it, forgetting it completely. You can view the beast as a representation of all that is bad about nukes, sure, but then what would you get? Nothing more than the statement: nukes are bad and destroy things. Oh yeah, then there's the fact that the nuke-symbol is killed by ... drumroll ... an atomic weapon. They didn't think that one through, apparently. There is one original element that arises during the attempts to fight the monster. After the military fends off the monster the first time, a group of them try tracking him. Inexplicably, they fall ill. It is then discovered that the monster was also a haven for all sorts of prehistoric disease, which the soldiers contracted, causing them to fatigue greatly and become sick. Now, that's pretty scary. It's so effective, in fact, that Cloverfield, an adequately scary film in its own right, would use the same technique, to even greater horror, fifty years later. But as the spirit of 20,000 Fathoms goes, this concept is quickly forgotten in favor of more generic monster fare. These writers just couldn't recognize a good idea when they found one. As should be expected, the best thing about this movie is its vintage Harryhausen special effects. The beast, essentially a giant lizard-dinosaur hybrid, may be a stop-motion creature, but it moves just as realistically as the real thing would. When it walks down the street, it doesn't just walk down the street, it also bobs its head, looks around, and periodically flicks its tongue. Its texture is great, too, with plenty of small, detailed scales and even distinct muscles in its throat. If you look closely enough, you can spot a flaw or two, such as skin bunching up at times, but these flaws are minor and practically unnoticeable. The monster is convincing to the point where it looks like a monster, not a special effect. From any perspective, The Beast from 20,000 Fathoms has nothing to offer beyond a screen-time-starved monster and a lot of frustration. 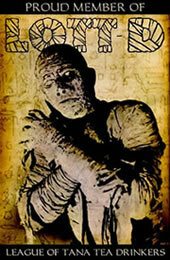 It's another one of those movies with great special effects, a bad story, and too much time spent on the bad story. Considering there is no reason to watch this particular monster movie other than to see its titular beast, I recommend watching the trailer instead. Then look at the poster for a minute. Those two things contain everything this movie has to offer. Submitted by Jim Hammond (not verified) on Mon, 2009-11-09 21:31. I was about to rush to defend this movie, but then I remembered the context of seeing it. Your points were well taken for the most part, but the scenes with Cecil Kellyway sparkled, and the sequence in the diving bell, though wonderfully wrought by Harryhausen, worked because we cared about Professor Elson. The lighthouse scene, which came directly from the Ray Bradbury story, The Fog Horn, was also wonderfully done. I’d even take those two and loop ‘em. My context? I saw it when it came out. I was ten and my folks took me to a movie house in Point Pleasant, driving from Manasquan, both on the south Jersey shore. It scared the crap out of me! And I did remember the special effects guy, and since watched just about every movie he’s done. The best part though, was driving home in a ’52 Ford open convertible. The warm summer breezes and the comfort of my parents reassuring me the world was an OK place again. Submitted by Robert Ring on Mon, 2009-11-09 21:41. If I had seen it when it was originally released, I probably would have felt the same way. Submitted by Erich Kuersten (not verified) on Sat, 2010-04-17 21:34. Man, I'll defend this movie through thick and thin, if only because I've seen it countless times from taping it off local TV in the early 1980s, a time when there just wasn't that much stuff out on video, and you could grab all sorts of weird things late night, like 200,000 fathoms. It makes a good trilogy with It Came From beneath the Sea and the THing as they all have Kenneth Tobey in them, who was born to play the role of the major called in to assess the damage and fight the monster. He's really cool! Good presence... gravitas. The only problem is the lead here is not so good, some accented square. Also, you could loop the monster scenes but it would be (more boring) - the trick is to use the build-up to slow your mind down, fall in and out of sleep, then you dream in monstervision.